The proper annual charge for third-party pole attachments has been a bone of contention between the telecommunications companies and Public Utilities for several years. As regulations differ by State and type of utility, the correct methodology for your utility may be difficult to assess. The traditional FCC method used by IOUs, may not be the appropriate methodology for your utility. EES Consulting has been successful in applying several rate calculation methods, including the APPA methodology, to pole attachment rates and negotiating fair and equitable pole attachment rates for utilities. EES Consulting has also provided assistance in reviewing and updating contract terms and conditions in a fair and equitable manner. RCW 54.04.045 can be interpreted as one-half FCC Telecom and one-half APPA. 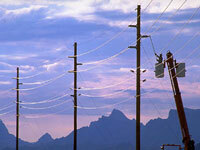 Transmission poles are allowable in the rate calculations. APPA contract terms and conditions, as used by Pacific PUD, are appropriate and fair. PUD pole survey and number of attachment estimates were accomplished in a reasonable and practical manner. Skamania County PUD engaged the services of EES Consulting to update its pole attachment rates. Washington is one of the states that have certified with the FCC to regulate their own pole attachment rates. The Washington State Legislature passed Engrossed Second Substitute House Bill 2533 (ESSHB 2533, amended RCW 54.04.045) related to pole attachment rates for PUDs in 2008. Based on the methodology outlined in RCW 54.04.045, EES Consulting provided a report which provided an overview of pole attachment regulations, rate determination methodologies and provided the results of specific calculations for the PUD.